"Until I was 15 years old, for me, wine was only Retsina. Resinated wines," Papagiannakos said. "Everyone in my village, when we were referring to other white wines, we would call them unresinated wines, as if it was a fault." His region, Attica, is famous for the quality of its pine resin, so much that wineries from other regions use it in making retsina. Naturally it wasn't easy to go in another direction. "When I was 22 and I was a student, I convinced my father not to put resin in one of the tanks. He said, 'What am I going to do with it? I can't sell that wine.' I said, 'Let's see how it is. We can mix it in with another tank with resin and make a lighter Retsina.' 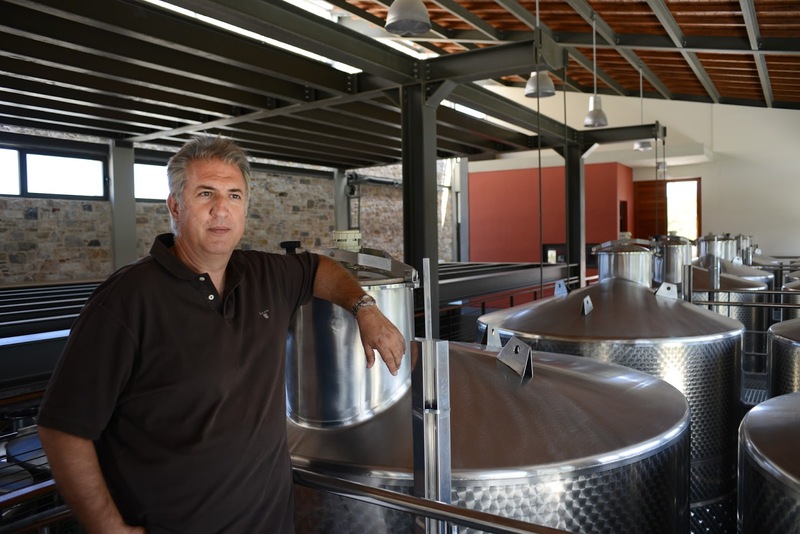 "
Now 55 years old, Papagiannakos took over the winery from his father in 1991. He spent the first two years preparing for unresinated wine by buying new stainless steel tanks with cooling jackets. "My father didn't have the ability to use cooling jackets to cool fermentation," Papagiannakos said. "They were losing some aromas." That wasn't the only change he made. "In my father's era, they were harvesting the Savatiano grapes overmature, so they were losing the acidity," he said. "This was a big mistake. They wanted high alcohol wines. This changed when I took over. We harvest at the right times and right pH. Those things change the profile of Savatiano." Papagiannakos said his neighbors thought that the wines he was producing couldn't possibly be 100% Savatiano. "One neighbor was convincing other people that I had added at least 100 kilos of bananas inside. She couldn't expect Savatiano to be so aromatic, he said. "Everyone for the first 5 years, they were saying I was using something else, something chemical, some Sauvignon Blanc. They didn't think I could make a Savatiano this way." Now there are at least 50 wineries in Attica making unresinated Savatiano, he said, but his still stands out. "97% of our vineyards are not irrigated," he said. "The Savatiano roots go more than 30 meters deep. The vines are very healthy. We have no infections because of lack of rain during the summer. We don't spray." 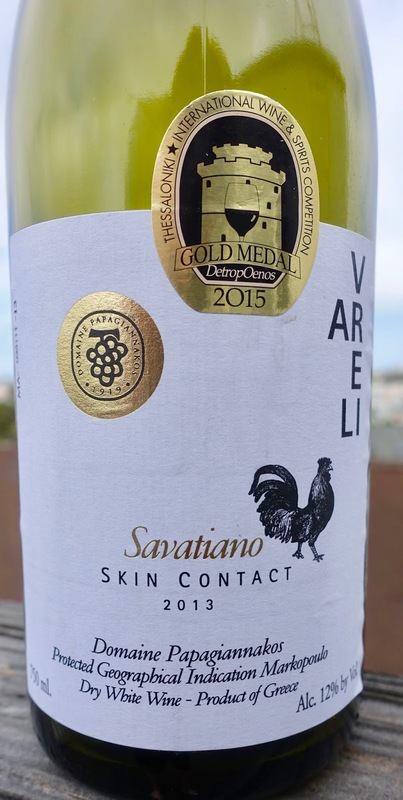 The most interesting of his Savatiano wines in the US is Domaine Papagiannakos "Vareli" IGP Markopoulo Skin Contact Savatiano 2013. It's available for under $20, and well worth checking out. The current release of this white wine is 2013. That should catch an oenophile's eye. It's fermented halfway through in stainless steel and then transferred to French oak barrels to finish fermentation and age, but I would never have guessed this from tasting it. "I have experimented for many years with different barrel makers," Papagiannakos says. "I don't want the oak to overwhelm the wine, to cover the fruitiness of each grape variety." And it doesn't. There's a sandy saltiness to the aroma. On the palate it's expansive: rich yet dry, building in intensity, citrusy yet not fruit-driven, finishing with your mouth taut. This is a wine you could drink and think about or guzzle happily with leftovers, and I did both. Just 12% alcohol. 93 points. Order it here. I also liked Papagiannakos IGP Markopoulo Old Vines Savatiano 2016 (12.5% alcohol). It's chalky and crisp on the nose. In the mouth, it's lean but intense -- an attack of freshness that lingers, leaving a pleasing citrusy note on the tongue after a long finish. Not complex but intense without being heavy. I'm told that this is actually the same wine (different vintage) as the one below, and has just added "Old Vines" to the label. I couldn't find it yet on Wine-Searcher but it is in the country and should show up soon. 91 points. The entry-level Papagiannakos IGP Markopoulo Savatiano 2015 (12.5%) is fine as a chalky, fresh seafood wine. It can be had under $15 and is good value at that price. Order it here.